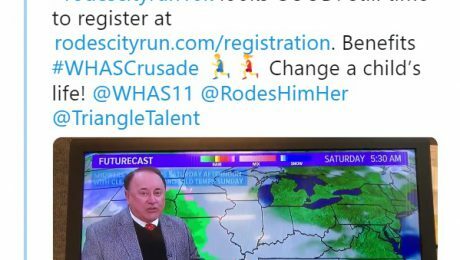 The Rodes City Run is this Saturday – March 9th! It starts at 8:00am. The WHAS11 First Alert StormTeam forecast calls for a high of 58 degrees! UPDATE: According to the StormTeam’s Reed Yadon, it’ll be dry with no rain expected til Saturday afternoon. 1. You can register in person at packet pick-up at Slugger Field beginning at 11:00am this Friday. 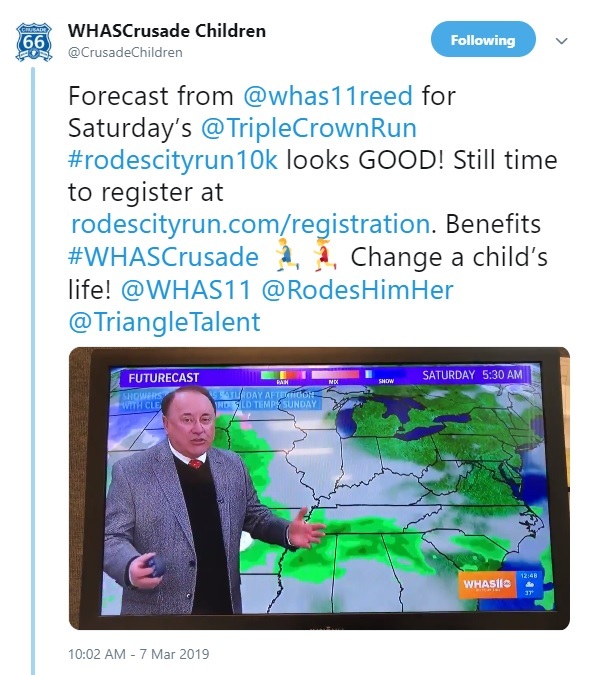 Thanks to family and friends at the Windsong Group Facility, longtime WHAS Crusade fundraiser Paul Hall kicked off his 25th year of collecting for the WHAS Crusade for Children. In spite of being wheelchair-bound with cerebral palsy, Paul has collected more than $23,000 since 1994. Recent stories about the Zika virus brought the medical condition microcephaly to the forefront. But in truth the causes are unknown for most babies born with smaller heads and brains. The Perry family is facing the diagnosis with their son, Hayes. They’re finding help and hope at the Kids Center for Pediatric Therapies, an agency supported by the WHAS Crusade for Children. The Kids Center says WHAS Crusade support to the Center’s effort with children like Hayes is invaluable. Grants from the WHAS Crusade provide equipment and personnel that the Kids Center wouldn’t be able to afford otherwise. Step back in time to the days of beehive hairdos were standard and color television was new. Watch this “big time” opening of the 1968 WHAS Crusade for Children telethon. The 66th annual WHAS Crusade for Children is set for June 1st & 2nd! The #WHASCrusade kicked things off by debuting this year’s pin and product design. This new design was inspired by the Route 66 TV series and highway sign. Stay tuned! WHAS Crusade for Children merchandise featuring the new design will be available for the public to purchase. A former WHAS-TV General manager has died after a battle with cancer. Robert “Bob” Klingle, who served as general manager from 2000 to 2007, died Monday, January 14 in Scottsdale, Arizona where he was undergoing treatment for prostate cancer. During his time in Louisville, he led the station with special coverage of the September 11, 2001 tragedy and signed a new deal with the University of Louisville to make WHAS11 the home of the Cardinals for several years. Klingle also expanded the WHAS Crusade for Children by creating the first-ever Crusade Endowment to help ensure the Crusade’s future. Klingle would say right up until his final moments, “I am the luckiest man in the world”. The family will hold a celebration of life in Louisville this spring. Expectant parents hope and pray that their child will be born perfectly healthy. And that was the case for the Eckstein family. However, when their son, Leo was born with hearing loss they say the initial diagnosis took them completely by surprise. Thanks to funding from the WHAS Crusade for Children, Heuser Hearing Institute has been able to provide equipment and therapies to give youngsters like Leo every chance to fulfill their potential. Since 1979, Heuser has received Crusade grants totaling more than $1 million, which have helped thousands of children with hearing issues.